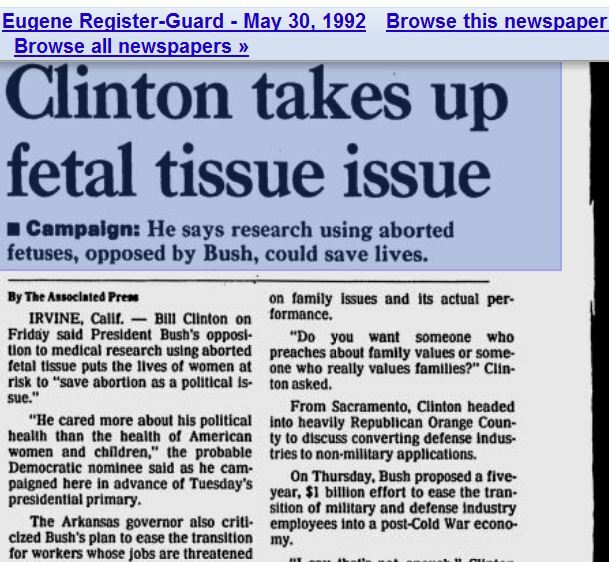 President Bill Clinton was a supporter of fetal tissue research. The federal government currently controls the extent of fetal tissue transplantation solely through its allocation of research funding. Federal law explicitly defers regulation of the use of fetal tissue to the states. 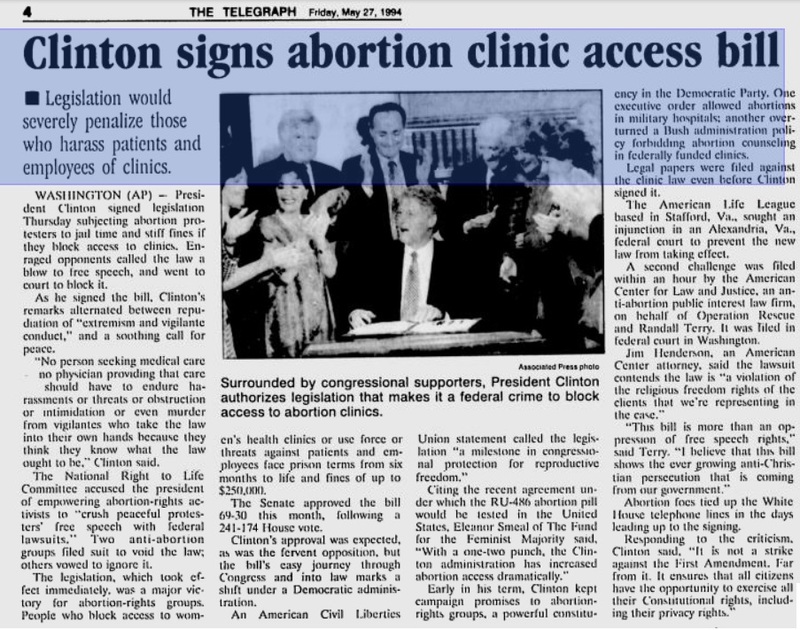 However, in 1988, the Reagan administration injected its anti-abortion political philosophy into the field of science funding by taking a stand against fetal tissue implantation. 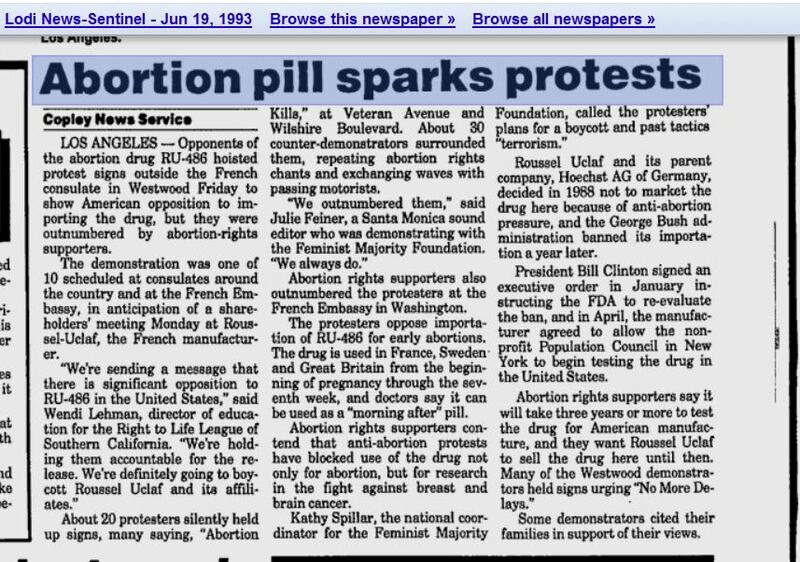 In that year, the National Institutes of Health (“NIH”) began a voluntary moratorium, banning the use of tissue from elective abortions in fetal tissue research. It did so with the explicit intention of delaying further research pending discussion of the legal and ethical issues involved. In September of the same year, an NIH Advisory Committee voted unanimously to recommend that the moratorium be lifted. 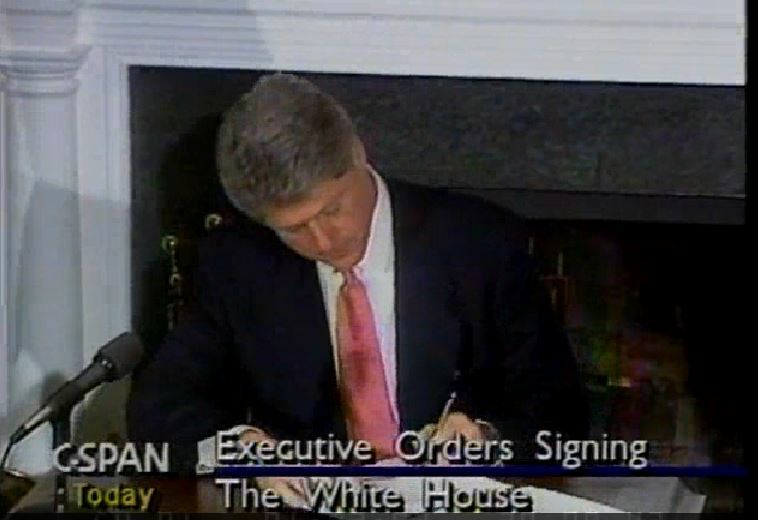 However, the moratorium remained in place, despite the Advisory Committee’s recommendation.60 President Bush never lifted the ban while he was in office. 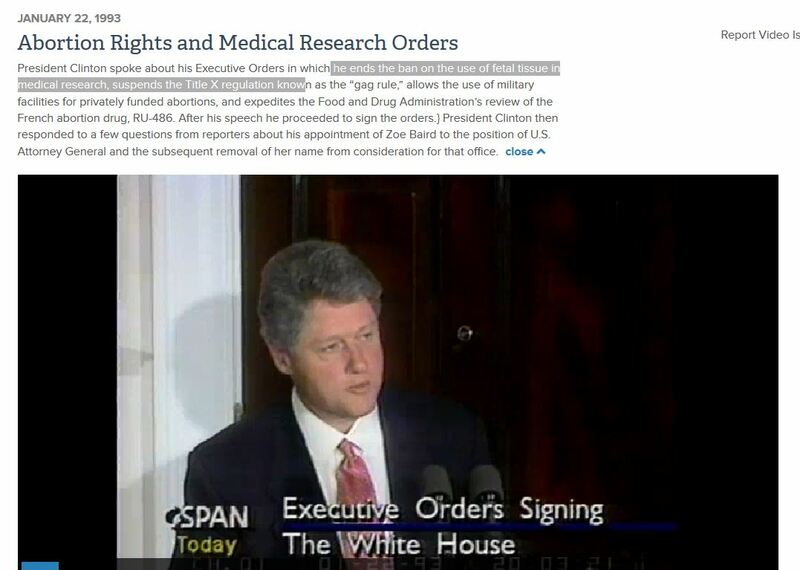 Although the Reagan/Bush moratorium was a lightning rod for controversy, it did not halt all fetal tissue research. Because the moratorium only applied to federally funded research, private research could-and did-continue during the moratorium. In addition, an exception to the moratorium that permitted funding for fundamental scientific research allowed the NIH to spend $45 million on fetal tissue research while the moratorium was in place. Also, the moratorium did not affect research in Europe and Britain-where Gosden’s team developed its new procedure. 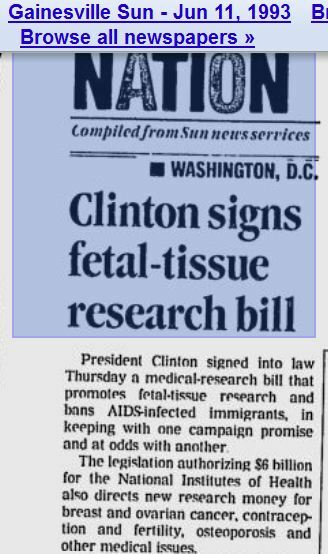 In January 1993, on his second day in office, President Clinton lifted the moratorium on federally funded fetal tissue research. Listen to his speech on the here. 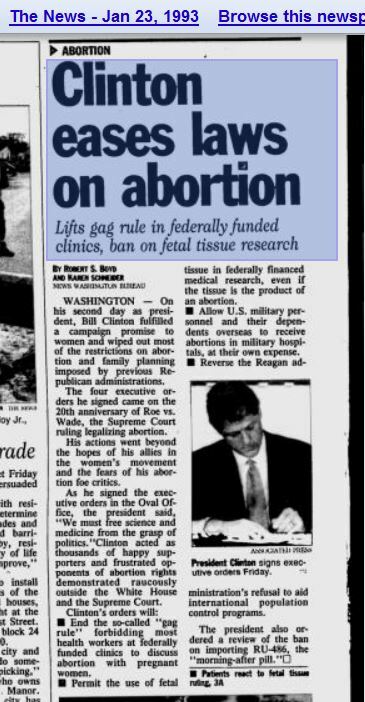 Congressional hearings on the regulation of fetal tissue research soon followed.In March 1993, Congress passed the National Institutes of Health Revitalization Act. This Act amended the Public Health Service Act to authorize research on human fetal tissue transplantation without regard to whether the tissue is obtained from a spontaneous or induced abortion. It is unlikely that the debate concerning federal funding of fetal tissue transplants is over. The current administration has merely sidestepped the issue by lifting the NIH moratorium. States are still free to legislate against the use of fetal tissue, and, as demonstrated by the federal moratorium, NIH funding of fetal tissue research may be only as healthy as the tenure of the current administration. 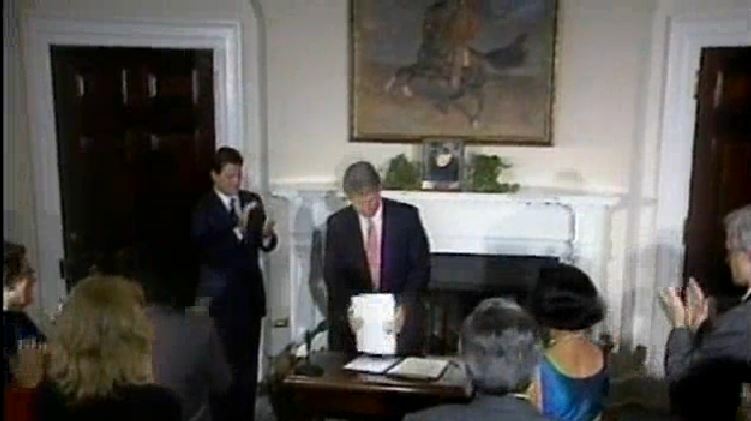 The influence of politics on federal funding of research addressing human reproduction was underscored quite recently. 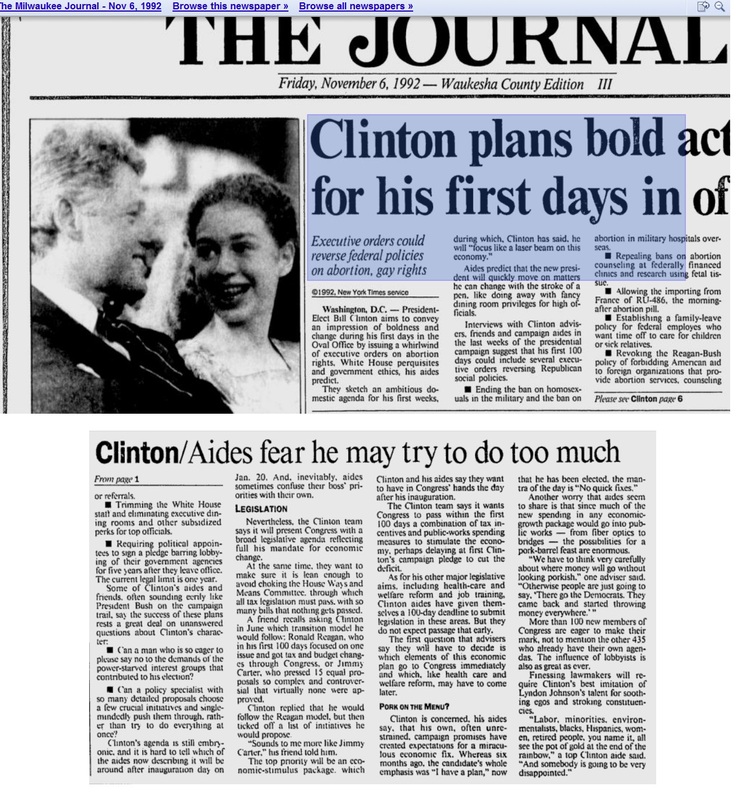 On December 3, 1994, in the wake of a resounding Democratic electoral defeat, President Clinton ruled out using federal money to support work on human embryos specifically created for research purposes. The President, citing “profound ethical and moral questions” associated with the subject, refused to follow the contrary recommendation of a National Institutes of Health panel.69 Nevertheless, the President’s order did not specifically bar federal support for research carried out on left-over embryos from IVF clinics. 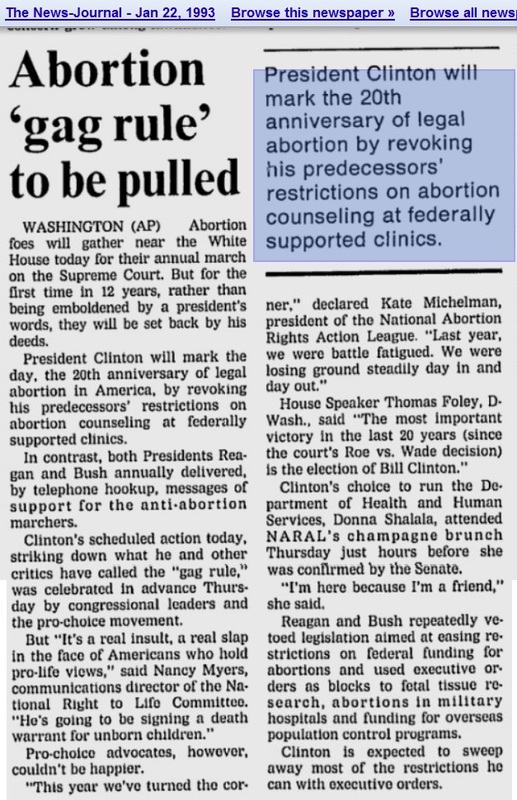 Bill Clinton was the most radically pro-abortion president at the time he served his two terms in office. 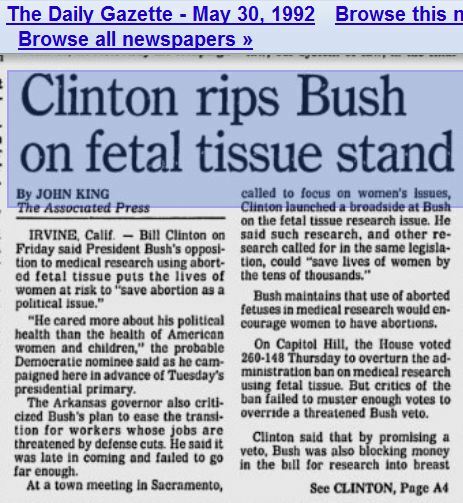 This entry was posted on July 20, 2015 at 2:22 am and is filed under Uncategorized with tags 1993, Aborted Baby Body Parts, Abortion, Bill Clinton, fetal research, fetal tissue, Hillary, Planned Parenthood. You can follow any responses to this entry through the RSS 2.0 feed. You can leave a response, or trackback from your own site.